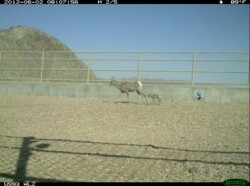 A remote camera recently captured a photo of a bighorn sheep ewe and her lamb crossing one of the innovative overpasses along Highway 93 near Hoover Dam, showing the sheep have adapted to using the overpasses and are now teaching their young to use them at an early age. There have been more than 500 bighorn sheep crossings at the three wildlife overpasses in northwestern Arizona in the past 15 months, 229 in the last month alone. Compare this with 32 crossings at the three underpasses along Highway 68 during a two-year study. Completed in 2010, the Highway 93 overpasses represent a historic collaboration between state and federal agencies and other partners to develop an innovative approach to protect the Black Mountains bighorn sheep herd in northwestern Arizona, the largest contiguous desert bighorn sheep herd in the nation. The overpasses were designed to reduce habitat fragmentation – which splits the herd apart and diminishes overall genetic viability – and decrease the number of vehicle collisions with wildlife, making the highway safer for motorists. Overpasses were chosen instead of underpasses because research indicates that bighorn sheep are reluctant to use underpasses due to vulnerability to predators. The overpasses were a cooperative effort between the Arizona Game and Fish Department, Arizona Department of Transportation (ADOT), Federal Highway Administration (FHWA), and the Arizona Desert Bighorn Sheep Society (ADBSS).